I came across this article while I was, as usual, scrolling down my Facebook notifications page two days ago. I have to admit that the connection to the discussions during the course was not apparent until I finished the readings on racial disparities for our last class, and I found out that it resonates with two issues presented in the anthology Race and the Genetic Revolution. These are, namely, the problem of how, if an authoritative institution wants something to happen, it will happen despite any degree of objection, as well as the question of how do we challenge the judicial and legislative systems. The refusal to change the inadequate midazolam anesthetic and the agonizing 34-minute death of Ronald Smith raise the question of the need to revisit the legislation about capital punishment and the perverse perception of humanity. I do understand that it is hard to sympathize with convicted criminals (in the case, of capital murder of a woman), and that I would personally not be unbiased as an attendant to the execution or court, but what makes a lower court forego decisions by an upper one and insist on, as cited, ‘’knowingly torturing’’ a person ‘’who was almost certainly awake’’, and isn’t ensuring just treatment of everybody the main idea behind the justice system? I believe that the article reiterates how personal biases affect the way we address people and how predetermination in law is an unsinkable entity that brings upfront our own subjective desires, dismissing ethical treatment and ‘’human decency’’. I wonder what a normal human being (here I mean a person with no legislative/judicial agency and am not putting forward any moral implications) can thus do to protect themselves despite having an army of attorneys and whether execution is a true measure of justice and not an eye -or-an-eye scenario. Moreover, another class reading resonance question, is the subtle distinction between what is right and what is wrong and what is legal and illegal. Apparently, the system treats these two word pairs as synonymous, but then why wouldn’t it allow the convict to be executed by a bullet? I find it deeply disturbing that death ought to be ”protocolized” in legislative terms, as if a biological experiment is carried out and not the life of a human being, be it a murdered or innocent person, is being determined (I guess the idea of forgetting personality and animalizing the body through execution reverberates with everything we learned in class). Hence, the article puts forward he question of what exactly human decency is and challenges the idea of using torturous capital punishment. I have been deeply disturbed by one allusion in this text, however: what are the moral implications of being given the opportunity to construct and sign one’s own death penalty, and why are still executions legal? Why is such a progressive and evolving species like us humans still primitive in the application of ethics despite all circumstances? I wonder what your thoughts are. The town of Princeville, North Carolina is known as one of the oldest towns charted by freed slaves and continues to be a predominantly black community (96% of the population is African American). The town has been historically prone to floods with the most devastating flood to date being Hurricane Floyd back in 1999 until this past October when Hurricane Matthew hit. Now many town residents are considering selling their homes to the Federal Emergency Management Agency even though doing so threatens to end their community. At the same time, many residents feel a deep sense of pride for their community for what it stands for historically as being one first established by free slaves. In class we’ve discussed this idea of Afrofuturism as a comparison of events in the past and taking them in context with the present or even events of the future. Princeville reminds me of Afrofuturism through the experience that its residents are having as a result of the recurring flood issues that have plagued the town since its beginning. Many residents reject relocation not only because of the sense of home that they have for their current location but also out of fear of losing the community itself as many historically freed slave charted communities have in the past. It’s amazing to think that this community has survived as long as it has even against likely the doubts of the slave holders who provided them with this distressed and pollution inclined land. If anything I wonder why communities like these haven’t been held by the government as historical sites and protected as such. I am especially astonished that even with the knowledge that communities of similar historical background have ended up dying away as a result of removal and relocation, Princeville is still under threat of perishing like the others. In my Junior Seminar, we had Professor Ruha Benjamin as a guest speaker to provide us insights into how to effectively carry out in-depth interviews. Professor Benjamin started off her talk by showing us a New York Times video clip on the story of the Havasupai Indians, who donated samples of their blood for diabetes research that was conducted at Arizona State University. This incident was briefly mentioned in Genetics and the Unsettled Past, but it is worth expanding on because the Havasupai’s story is an important and powerful one that is directly related to our final class unit. The Havasupai is a community with high rates of Type II diabetes, so members were eager to find out the cause. However, university researches would end up using their blood for other forms of research outside of what they donated their blood for, which would lead the Havasupai to retrieve back their blood. In addition, the University would provide them with a $700,000 compensation. This video shines a light on the desire for groups to understand their communities past. As we learned from our readings, such desires were and still are extremely common. Different stakeholders use this public interest in genetic understanding to exploit marginalized communities and to use their genes for their own purposes. Moreover, culture plays a huge role in this instance. As mentioned in the video, blood is extremely sacred to the Havasupai. At the end, we see the Havasupai perform a type of prayer as they retrieve the blood from the University’s lab, and one of the Havasupai women is in tears when she is in the room where the blood was held. I was curious to hear people’s thoughts on this story. I’m especially curious about people’s thoughts on the role of culture in these types of instances. In addition, I would like to hear people’s thoughts on the $700,000 compensation. In a sense, I am glad to hear that they received compensation at all, because exploited communities have historically been deprived of reparations. However, I’m also disturbed by the gesture because it seems to suggest that money is all that it takes to repair the damage created. Looking forward to hearing people’s thoughts! The poem can start with him walking backwards into a room. that’s how we bring Dad back. I can make the blood run back up my nose, ants rushing into a hole. your cheeks soften, teeth sink back into gums. I can make us loved, just say the word. I can write the poem and make it disappear. maybe she keeps the baby. you won’t be able to see beyond it. I’ll rewrite this whole life and this time there’ll be so much love. Step-Dad spits liquor back into glass. we grow into smaller bodies, my breasts disappear. He takes off his jacket and sits down for the rest of his life. Warsan Shire’s poem titled “Backwards” paints a heartbreakingly beautiful story of, what I interpret as, the disappearance of a father from one’s life. Despite my inability to determine whether or not this disappearance is intentional, I find that the language used creates striking imagery of helplessness and pain; the body, surrounded by surprise and desperation, grows into “smaller bodies” and the “breasts disappear.” It creates of the image of someone trying to disappear into the ground beneath them out of shame, pain or humiliation. In the case of the poem, the reason is one that ties to the disappearance of her father, who, she desperately wants to walk “backwards into a room,” the room being the household. What strikes me most is the role of nature in creating the personification of a tree and other natural things. The “stumps for hands, and use of “sink” reminds me of sinking into the ground, the earth, the dirt. If we look at the theme of nature and “natural occurrences” as a prevalent voice within the poem’s narrative, one can infer that the father might’ve experienced something “natural,” like death, once he left home and can no longer return. Hence, the speakers desire to “rewrite this whole life.” After the biological father’s disappearance, or death, enters the “Step-Dad” who, if the speaker could rewrite history, “spits liquor back into glass.” This suggests that the Step-Dad suffered from substance abuse—the line before demonstrates the impact of this substance abuse on the family, seeing as how the line before states that “mum’s body rolls back up the stairs, the bone pops back into place.” In a different life, the speaker’s biological father would remain and thus the family would avoid any future abuse or pain. While this poem’s connection may not be as obvious to our class, I believe it connects in ways that we are now starting to discuss. Warsan Shire, a woman of color and a poet, is writing about a painful familial experience. While the origins of this experience are unknown and left up to interpretation, I can’t help but make the connection to how in class—through the literature we’ve read and discussions we’ve had—we see the way in which societal conventions shape familial dynamic and experience. What are your thoughts on this notion? Is your interpretation of the poem similar or different to mine? I came upon this article while completing an assignment for my freshman seminar this semester on the social determinants of health. The article discusses the effects that excessive stress has on children as a result of violence, poverty, trauma, and other forms of “prolonged adversity”. The article names this form of stress as “toxic stress syndrome” and describes how it continues to plague children across communities and affect their health and well being over time. This article specifically discusses the toxic stress experienced by children of lower socioeconomic backgrounds and how their health overall compares to that of children of high social standing. While reading this article I couldn’t help but think back to a major theme of our class discussions these past few weeks which concerns the notion of race as a political construct. During my read of this article, I found myself asking whether racism would be considered to be one of the listed traumas that results in the formation of toxic stress syndrome in children? Not only can racism instigate deeply traumatic experiences, but it is also a persisting trauma into adulthood that unfortunately doesn’t end. I believe it would be interesting to explore the effects that racism has on children of color from all socioeconomic backgrounds and then compare the stress levels to see if there is a relationship between racial trauma and “toxic stress syndrome” that develops in children. Another detail I found important consider that the article itself doesn’t delve deeply into is the question of who is being directly being affected by this toxic stress the most? Who lives in these communities where “prolonged adversity” is a lifestyle due to unequal distribution and access to resources? For most, the answer would be and is consistently people of color. I believe that we can see here how inequality not only distresses people of color through their economic status, but through their health status as well. Earlier this month, the New York Times posted an article about incarcerated women in the United States and the detrimental effects that their imprisonment has on their families. The article specifically speaks out on the effects that female incarceration has on the children of those imprisoned. According to a study conducted by the Russel Sage Foundation, there appears to be a clear connection in America between the 64% decline in household resources and the incarceration of a family member. In turn, this 64% decline appears to only further increase the poverty and racial gap that exists here in America. This article reminds me of our class’s conversation about birth control and sterilization in history with regard to women of color. I found this article to be most relevant with regard to understanding the different forms of birth control that are utilized today including incarceration. Taking into context both the history of forced sterilization and ineffective forms of birth control that targeted women of color and the fact that women of color are more likely to be incarcerated than white women, it’s possible to visualize modern day incarceration itself as a new form of sterilization. What I find to be most important to remember while reading this article are the differences that exist between the rates of prosecution of women of color compared to that of white women. Through further research into the topic, I learned that black women are 3 times more likely to be incarcerated than white women and Hispanic women are 2 times more likely to be incarcerated that white women. By keeping these incarceration rates in mind, we are able to paint a clear racial picture of what classes of families are being predominantly affected by these detrimental effects discussed in the article. Women of color’s imprisonments immediately inhibit both their ability to reproduce children as well foster the children that they already have. This thereby increases the mortality rates of the children of these women and in turn steadily decreases the population rates of people of color. 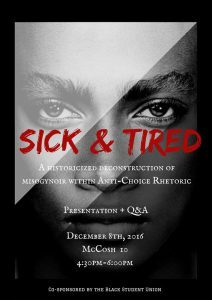 Today, there was a teach-in called “Sick and Tired: A Historicized Deconstruction of Misogynoir within Anti-Choice Rhetoric.” (I just realized that I should’ve shared the event with the class. Sorry about that!) The event was hosted by undergraduates Destiny Crockett ’17 and Trust Kupupika ’17. They provided a historicized breakdown of how anti-choice arguments regarding abortion have historically targeted black women and lead to impacts that ranged from the sterilization of Black women without their consent, to the surveillance of poor Black women who used social services to take care of their children. This breakdown was build through the framework of Dorothy Roberts’ Killing the Black Body and other essential scholarly and literary works that influence a nuanced understanding of reproductive liberty and race and gender justice. This event is directly pertinent to our course, especially to our unit on reproductive rights. I know that my previous blog post on Sophia Vergara was on a similar topic, but I think it’s interesting to put these two events next to each other because one is in the context of pop-culture, and the other is in the context of academia. It is important to realize how different platforms can be used to develop different frameworks of understanding around the same issues and that all these frameworks are valuable. In regards to the “Sick and Tired” event, I appreciated Crockett and Kupupika’s introduction to the word “misogynoir” because it hones in on the violence that black women specifically experience at the hands of anti-choice ideology. To me, their use of this word shines a light on the importance of language in discussing systems of oppression against particular groups of people because it makes articulating these systems easier and more tangible. Additionally, this teach-in was especially important in light of a previous event that happened on campus that essentially discussed how black women should adhere to pro-life ideology. I was proud to see that Crockett and Trupupika were able to go against the blatant transmisogynoir rhetoric that was tied to that event. I wanted to hear people’s thoughts on either of the two events that I mentioned (to the capacity of your knowledge about them). Moreover, I would like to hear more about how we can have critical conversations around these types of issues on college campuses that utilize not just academic framework, but also others. The article states how this issue is “disturbing” and “all too real,” which we know is true from what we have learned in class during our unit on reproductive rights. Loeb’s claims that he is being “denied the right to fatherhood,” which only works to further the oppression of women in regards to their reproductive rights. Furthermore, this oppression is complicated by the fact Vergara is a women of color. According to the article, “Vergara told Howard Stern in May 2015 that she doesn’t want to ‘bring kids to the world where it’s already set against them. '” Vergara’s logic is similar to the logic of the women of color we have read about in class. These women were afraid of having their children be subjected to the systems of oppression that would target them because of their race and class. I was wondering if anyone else has been following this story (I just found out about it by scrolling through my Facebook feed). If so, what are your thoughts on the issue, especially in regards to the fact that Vergara is famous and that this issue is happening in the circle of modern pop-culture media? These articles detail Philip Zimbardo’s infamous psychology experiment entitled The Standford Prison Experiment. This experiment was designed to see if people would take on a certain persona when put into different situations. To test this, 24 males were taken and split into two different groups. Half would serve as prisoners in this experiment and the other half would serve as the guards in the prison. With consent and the knowledge that the participants could leave the study at any point, the prisoners were “arrested” and the experiment began. This psychology experiment soon turned very dark, with abuse of the prisoners by the guards occurring very rapidly. It was clear that both sets of individuals had fully taken on the different personas that Zimbardo had arbitrarily put them in. And though the experiment was going to last for two full weeks, it was cut short and ended after 6 days, because of the intensity of the abuse that was occurring within the study. This study highlights many themes that are quite common in a living laboratory, while also being quite unique in the fact that it was a psychology experiment with an artificial setting, as these men were not actually living in a prison. And what also made this study quite interesting was how abuse was not only happening within the experiment, but what the horrific results of the experiment demonstrates about treatment in prisons in general. This experiment tied back into the theme of experimenting on people with limited power. The entirety of the experiment rested on the backs of the prisoners, who were brutally tortured and many of whom were emotional damaged for a long time after the experiment ended. This type of abuse on a certain group of people for the knowledge, benefit and amusement of others is reminiscent to many of the living laboratories discussed in class. And the horrific results of the experiment, of how guards will treat their prisoners, can be extrapolated to a different laboratory, the current prison system in the United States. This experiment shows that within the prison system, there are common themes of abuse of the powerless by the powerful and that the people within them are marginalized. And this abuse in the prison system does nothing to rehabilitate the people within the system, and rather feeds into the vicious cycle of incarceration that occurs in this country. This article is about the cholera spread that took place after the 2010 Haiti earthquakes during the height of UN intervention. Until recently the United Nations have ignored assertions that Nepalese UN workers reintroduced the disease to the island after a 150 year absence. With only a month left in his term Ban ki Moon released a carefully worded apology that acknowledged the UN’s wrongdoings in the dilemma. Now the UN’s two pronged approach is their response for a half decade old problem. The first approach is more of a research and development approach with the intention to establish systems in place to respond to the disease, while the second prong is more policy based. The article poses the question of : to what extent was the reintroduction of the disease an “accident”? After the earthquakes in 2010 Haiti served as the perfect place to conduct research on a captive human population. Although this is not suggested in the article, the situation raises red flags. The UN’s 6 year late apologize raises the question of why now? It makes the situation look quite scandalous considering they only apologized recently and that delay of acknowledgement would be enough time to conduct research on the disease to study eradication possibilities. What also raises a lot of alarm is the fact that the very people that introduced the disease are doing the research. There seems to be a lot of overlap that begs the question who “accidental” was the resurfacing of the disease?